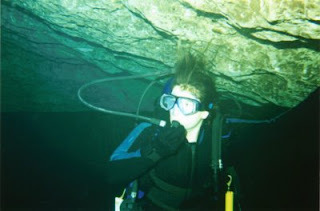 One of my hobbies is SCUBA diving. 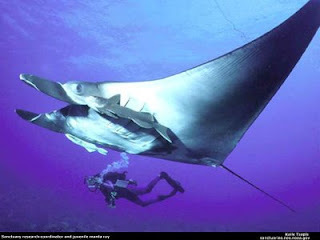 I am a certified PADI diver - and not just the crash course certification you get when you go on vacation. Nope, I spent the money and the time in class to receive my honest-to-goodness certification. That's me in the pictures. 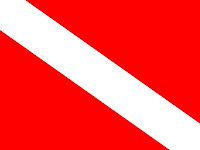 I've been diving in the British West Indies and Mexico. I live very close to Lake Erie, one of the Great Lakes. The Great Lakes hold the largest concentration of shipwrecks in the world. I've been on many of those wrecks, from modern steel sand suckers to 19th century schooners (tall ships). I have been in underwater caverns with 100 feet of solid bedrock above me and no way out but to follow a winding narrow corridor at a depth of over 100 feet, and I have been diving in the middle of the night with nothing but a Sabre Light to show the way. I've swam with barracuda, eels, sea sponges, loggerhead turtles, rays, skates, scratched the belly of a manatee or two, and miles upon miles of beautiful coral fields, and I've also been followed around and studied intensely by curious Yellow Snapper. I own several wet suits, air tanks (one looks like a bottle of Dad's rootbeer), buoyancy compensators (BCs), masks, fins, snorkels, dive cameras and housings...and if I need anything else, I'm sure I can borrow it from a buddy of mine. All of this that I have done and all of the equipment that I (and the rest of the SCUBA diving world) uses is all thanks to one man: Jacques-Yves Cousteau. Without his discoveries and contributions to marine science, none of this would be possible. 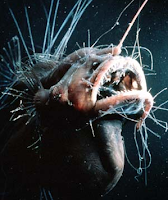 Without his research we would still know next to nothing about what lies beneath the ocean surface. 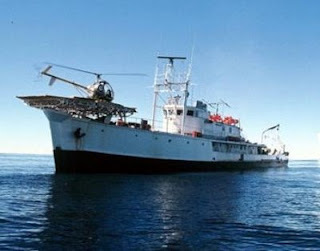 His first research vessel, the RV (research vessel) Calypso is the topic of this John Denver hit. The invention of SCUBA in 1942. On a small Riviera beach, Cousteau entered the water with his rubber flippers and some new-fangled completely autonomous diving gear - the aqualung, a compressed air device invented in 1925 by Captain Yves Le Prieur. The problem with the aqualung was that air continuously flowed from it, which put limits on how long a diver could use it. Cousteau modified the device based an idea he got from the Germans during WWII. The Germans requisitioned gasoline, and engineer Emile Gagnan invented a demand regulator that would feed the gas into the engine in just the precise amount the vehicle needed. Cousteau modified this device to work with air, placed it at the top of his aqualung, and the Self Contained Underwater Breathing Aparatus was born. Now a diver could move around more quickly with less fatigue, which meant less air consumption and longer bottom time (and consequently more time for undersea observation). The development of Denise the diving saucer in 1959. Denise was a permanent part of Calypso's standard research arsenal. This SP-350, aka Denise, nicknamed "diving saucer" because of its resemblance to the sci-fi UFOs of the period, was the first underwater vehicle designed and equipped expressly for scientific research. She sat a crew of 2 in her cabin, which she could take as deep as 1148 feet and could remain there for 4-5 hours. 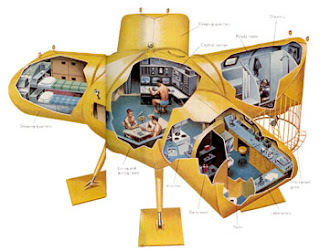 Cousteau designed this little submarine around the squid's propulsion system. It sucked in water from the front and spit it out the back. The crew inside looked through portholes that brought them to within centimeters, but more importantly, since the deeper one dives the darker it gets, Denise was equipped with 3 special underwater lights. These lights were movable by the crew inside, and could light up objects as far as 108 feet away (and at different angles). 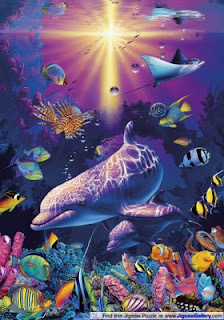 Denise's lights lit up a world filled with creatures that no man had ever seen before. Luckily, Denise's standard equipment included a radio and tape recorder and 2 cameras. The crew, however, were not limited to just observation. Denise had a sampling arm, which was a sort-of robotic extension of the vessel that could be operated by controls within. The operator could pick up objects as well as look at them. Because of Denise, more development was made of this technology, and today "Sea Fleas" (single-man diving devices) can dive to a depth 1640 feet. In 1942, Cousteau began tinkering with what would be come a submarine camera. It started with a regular Kinamo 35mm camera in a watertight case. The first problem he encountered was light. Everything looks blue under the surface, and objects quickly fade into obscurity. 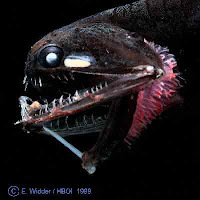 So, in 1948 Cousteau began stringing powerful lights on long cords linked to the surface by an electric cable, and the first in-color film footage was shot. 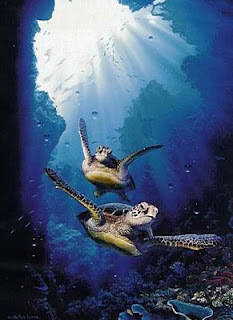 Cousteau and his team studied the behavior of light in the water. They noticed that reds were absorbed first, then yellows, then greens, then blues. The behavior of the light rays led them to develop an artificial light source that was capable of behaving according to the water, and as a result the colors captured on film were not only more accurate but were more vibrant and distinct. And since sea critters can move incredibly fast, he invented underwater scooters, which were basically lawnmowers with propellers, in order that a camera could follow them. Believe it or not, in the early 1960's Jacques Cousteau also made a hefty contribution to NASA's space program, but he didn't do it in the air. He did it between 30 and 300 feet underwater with his Conshelf experiments numbers I, II, and III. In these successive experiments, steel cylinders were placed on the bottom of various sea floors and Cousteau's "oceanauts" were placed inside to see if man could live under the sea. These guinea pigs were given every luxury - TV, radio, library, and bed. In Conshelf I, at 30 feet down off the coast of Marsielle, two men successfully lived for one week. 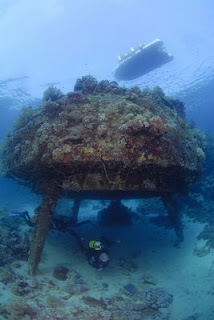 In the Conshelf II experiment, at 50 feet under the Red Sea, an entire village was placed inside and lived for a month. In Nice, France, the Conshelf III experiment housed 6 oceanauts at a depth of 328 feet for three weeks. While the experiments were a smashing success, they also proved that man had too many physical limitations and was just simply not meant to live in a world devoid of sunlight. It was the training that these oceanauts received prior to their Conshelf installation that NASA adopted and still uses today. 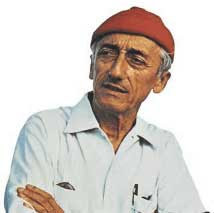 Visit http://www.cousteau.org/ to read all about Jacques Cousteau and his work, which has continued even after his death. If you go to the menu and click "Expeditions" you can see Calypso's "places she's been to" and read "the stories she tells". Here are a couple of my own SCUBA videos. If you don't stop drivin' that Hot Rod Lincoln." 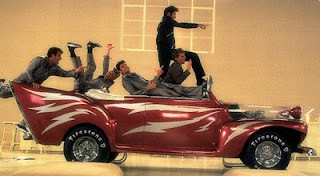 When Fords and Lincolns was settin' the pace. I was drivin' that Model A. It's got a Lincoln motor and it's really souped up. That Model A Vitimix makes it look like a pup. It's got eight cylinders; uses them all. It's got overdrive, just won't stall. With 4.11 gears you can really get lost. It's got safety tubes, but I ain't scared. The brakes are good, tires fair. The moon and the stars was shinin' bright. Passing cars like they was standing still. A Cadillac sedan passed us by. I said, "Boys, that's a mark for me!" By then the taillight was all you could see. So I thought I'd make the Lincoln unwind. I shoved it on down into overdrive. My speedometer said that I hit top end. My foot was blue, like lead to the floor. That's all there is and there ain't no more. And telephone poles looked like a picket fence. They said, "Slow down! I see spots! The lines on the road just look like dots." Crossed my fingers just for luck. My fenders was clickin' the guardrail posts. The guy beside me was white as a ghost. When I started to gain on that Cadillac. Knew I could catch him, I thought I could pass. Don't you know by then we'd be low on gas? We had flames comin' from out of the side. Feel the tension. Man! What a ride! I said, "Look out, boys, I've got a license to fly!" And that Caddy pulled over and let us by. 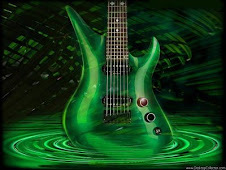 And down in the dips she started to rockin'. The cops was after my Hot Rod Lincoln! They arrested me and they put me in jail. And called my pappy to throw my bail. We're long overdue for a good car song - not the kind of song that just happens to mention a car while singing about something else but an song that pays homage to actual, physical, honest-to-goodness American heavy metal. The song was written and first performed in 1955 by Charlie Ryan, and later Johnny Bond recorded the song with some minor changes to the vehicle's specifications. However, the most popular version, which is the closest to the Charlie Ryan recording, was released in 1972 by Commander Cody and His Lost Planet Airmen (and how all of that name fit onto a 45 rpm record label, we'll never know). The hot rod race between coupe Fords and Lincolns mentioned at the beginning of the song is a section of southern California's "Ridge Route Highway", which winds over the San Gabriel and Tehachapi Mountains between Castaic Junction on the south. "Grapevine Grade" was a 6 1/2 mile section of Ridge Route Highway that was popular among young American motorists with a need for speed. While many people believe that this highway segment is named because of its many winding turns and switchbacks (resembling a giant grapevine), it was actually named Grapevine Grade because the early wagoners had to cut their way through thick patches of Cimarron grape vines. Even today, while travelling this famous stretch, off the road you will see patches of what appear to be ivy. These are actually Cimarron grape vines that date back to the 1800s. California was the birth place of the hot rod, thanks to the landscape of open country, dry lake beds, and to challenge the vehicle's handling...grades just like the Grapevine. And just like Santa, M&Ms, and The Grapevine, Hot Rod Lincolns do exist. At the time the races on the Grapevine were popular, the Hot Rod Lincoln was a 1931 Ford Model A coupe over a cut-down Lincoln Zephyr chassis. This Ford had a 12-cylinder Lincoln engine and a 4.11 rear-axle ratio and overdrive. The popularity of hot rod Lincolns gained so much momentum that they even became the getaway vehicle of choice of bootleggers and gangsters. In fact, if it wasn't for the Lincolns, we might not enjoy extensive vehicle modification like we do today - they were the first hot rods; and while this 1931 Ford has plenty of its own specs, it certainly didn't come off the assembly line that way. Even while the motor car was in its infancy, gear heads across the country were tinkering with their toys to achieve greater vehicle performance. "Hot rod" was a term that first appeared in the American language around the 1930's and early 1940's. While it's uncertain exactly where it came from, we do know that it specifically refers to the modification of an American car for the purpose of gaining linear speed. The term "hot rod" was the new, hip term to replace "gow job" and "soup-up". One theory behind the term "hot rod" is that it is a contraction of the words "hot roadster". Traditionally, a "roadster" is defined as a vehicle that only seats two people and does not have a roof, side windows, or a rear windshield. The absence of these features made their bodies light, and because of this (and because of their cool and sporty look) roadsters were a prime target for tinkering with. The early Model A's, however (which is the vehicle specified in our song) had only a single seat for the driver. (Other theories behind "hot rod" include: the practice of leaving the exhaust pipes exposed, which of course are quite hot while the vehicle is running; or referring to the connecting rods, cams, push rods inside the engine, or exposed frame rails of the car). To increase vehicle performance, mechanics would install larger tires in the rear than in the front, which raised the gear ratio for high speed. Leaving the standard size tires in the front lowered the vehicle to the ground and raked it forward, which decreased wind resistance and made the vehicle more aerodynamic. Mechanics would also cut louvers along the sides and into the hood to release trapped air and to help with engine cooling. 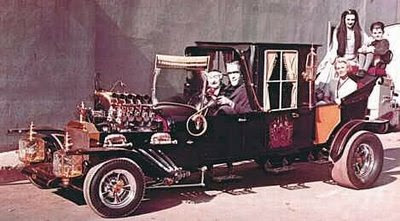 Ford was usually the chop vehicle of choice because their 85-hp engines were being mass produced by the millions. These engines were relatively inexpensive, and their configuration made it very easy to modify, not to mention that this same configuration provided the opportunity for an infinite number of enhancement. One of the earliest modifications to coax more speed out of these Fords was to remove the muffler and straighten out the pipes. Later, multiple carburetors were added on top of that, and the result was an engine that would zip these cars across open country and dry lake beds at speeds of more than 100 mph. Eventually, the body work caught up with the hot rod engine. Body modifications helped the vehicle's overall handling and performance. A favorite technique was "top chopping", lowering, or channeling the entire frame of the vehicle to within inches of the ground. Seams were frenched (smoothed and filled in) and skirts (smoothed out fenders put over the rear wheel openings). It was also popular to install lakes (exhaust that sticks out the side instead of the back). Of course the car had to look good, so chrome was in abundance as were elaborate paint jobs. However, as the cars got better, the parts got more expensive and junkyard parts just couldn't deliver what the mechanics were looking for. Eventually, Detroit entered the hot rodding arena and began to manufacture normal cars with get-up-and-go --muscle cars. While these cars had more than one seat, a roof, and all of the windows, they were made with huge displacement engines such as the Chevy 396, 409, and 427. Chrysler came out with the 440 and later the 426 hemi, which was racing-engineered (with hemispherical combustion chambers). Of course, the fuel crisis of the 1970s brought an end to the era of the whomping v8 performance engine, which put hot rodding on haitus for almost 20 years. Muscle cars and hot rods rarely saw the light of day except to make an appearance at a special day at the races, a car show, or the slow Sunday drive down Main Street. 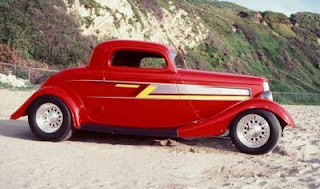 Hot rodding dwindled and became the hobby of those who could afford it - the parts to build it and the gas to drive it. However, in the 1990's, once again California revived hot rodding among youth. Young Latinos from California's Chicano culture found an interest in the modification of vehicles from the 1960s, particularly Chevy Impalas. 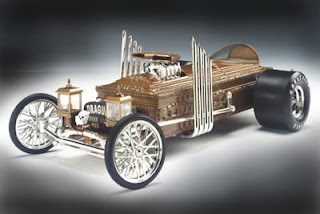 Thus, the lowrider was born, and although these vehicles aren't designed around increasing linear speed, the spirit of their design and modification remains true to the character of the hot rod.